At every level of government, the food and beverage industries won fight after fight during the last decade. They have never lost a significant political battle in the United States despite mounting scientific evidence of the role of unhealthy food and children's marketing in obesity. Lobbying records analyzed by Reuters reveal that the industries more than doubled their spending in Washington during the past three years. In the process, they largely dominated policymaking -- pledging voluntary action while defeating government proposals aimed at changing the nation's diet, dozens of interviews show. The journal Nature (link may be gated) recently had an interesting meta-analysis -- or quantitative literature review -- about yields from organic agriculture. The accompanying summary says, "conventional agriculture gives higher yields under most situations." This is probably true. Yet, even environmentalists are overreacting to the study. A recent article by Bryan Walsh at Time Magazine's Ecocentric blog is titled, "Why Organic Agriculture May Not Be So Sustainable." Organic agriculture commonly has a yield penalty per unit of land (see the Nature article above). Environmentalists should care about efficiency. Getting more output for lower resource cost is good environmentalism. Mostly, though, Walsh repeats common overstatements of the advantages of conventional agriculture. Conventional industrial agriculture has become incredibly efficient on a simple land to food basis. Thanks to fertilizers, mechanization and irrigation, the each American farmer feeds over 155 people worldwide. Not all productive technology improves the environment. Many technologies used in conventional agriculture are designed to save labor, not to save land. In Walsh's quote above, huge mechanized combines elevate the number of people fed per American farmer, but they make little difference to yields per unit of land (the key environmental issue addressed by the Nature study). From one sentence to the next, Walsh conflates food per American farmer with efficiency "on a simple land to food basis." Yield is not the same as efficiency. Organic agriculture commonly requires a tradeoff, giving up some yield and undertaking some additional labor and management cost in order to gain something of value for the producer and for the environment. Advocates for organic agriculture say the tradeoff is efficient -- getting the most output for the lowest resource cost when all environmental costs are accounted. Walsh's first sentence boasts of the "efficiency" of industrial agriculture, but the following argument fails to support the boast. Producing more grain is not the same as feeding the world. Any time the high yields of U.S. corn production are mentioned, it should be noted that most U.S. corn goes to ethanol and animal feed. Walsh seems to think that Iowa corn farmers do well at feeding the most people possible for the least land, which is false. If the goal is to feed the world, then most of the calories produced in Iowa corn fields are squandered already, and this loss matters more than the organic yield penalty matters. Most hard-headed well-grounded advocates for organic agriculture already understand the yield tradeoffs, and they already value efficiency. For example, Rodale studies over the years have always claimed that lower chemical input costs offset modest yield penalties -- a claim that may be nearly consistent the new Nature study. One sometimes meets beginning organic farmers who are dismissive of yields and efficiency. But one never meets an organic farmer who has been in business for five years and remains dismissive of yields and efficiency. There is one lesson in this whole argument for organic advocates. It is important to speak plainly about yield penalties and about efficiency. Perhaps Walsh was not sufficiently familiar with hard-headed well-grounded research on organic practices, but instead may have been reading some excessively optimistic pro-organic public relations. Then, when the PR message was contradicted by the Nature study, Walsh overreacted. It is best all around to state the relative advantages of environmentally sound production practices plainly and precisely from the start. Here in Boston this month, during the Coalition of Immokalee Workers' rainy march at the corporate offices for Stop and Shop supermarkets, with the way into the offices blocked by corporate representatives, hopes soared briefly. Despite the system analyst's courage, negotiators from the Florida-based farm labor group were unable to proceed further. Yet, it seems likely that the setback will be only temporary. On a visit to CIW offices in Immokalee this week, my family (including my two children, wife, and parents) enjoyed speaking with labor organizers about their successes since the time of my previous visit in 2009. The biggest victory has been a new relationship with tomato growers, who previously had refused to participate in the CIW's penny-a-pound bonus program, in which leading branded supermarkets and restaurant chains agree to pay workers a better piece rate for tomato harvest. The CIW's "ask" from branded companies seems profoundly reasonable. Here in New England, I suspect Stop and Shop will give way in the next several months, as have Taco Bell, McDonald's, Burger King, and the tomato growers themselves in previous campaigns. As a regular Stop and Shop customer, let me mention here that customers like me are following this issue closely, and a sensible negotiating position would generate a pile of customer goodwill and loyalty. If Stop and Shop negotiates, I will of course give the news effusive coverage in this space. Gina Kolata in the New York Times this week cast doubt on claims that supermarket deserts contribute to the obesity epidemic. The start of her article cites recent research that finds no association between supermarket deserts and risk of obesity. It notes that residents of low-income urban neighborhoods have as much access to supermarkets as residents of higher-income neighborhoods have. This fact at first seems counter-intuitive to most people concerned about supermarket deserts, but it is easy to understand with some further reflection. Low-income urban neighborhoods commonly have high population density, and they contain many medium-income residents along with the impoverished residents, so they sometimes offer too big a market for retail chains to overlook. The NYT article generated some controversy. Conservative pundits, as you might imagine, falsely claimed that food deserts are a "make-believe issue" and an "Obama lie." The liberal website Media Matters debunked the conservative coverage with typical thoroughness. Media Matters also found "food experts" to characterize the NYT article as "misleading," which I think was too harsh a description for reporting that seemed basically sound. My favorite authoritative statistics about the extent of supermarket deserts put the problem into quantitative perspective, without exaggeration. The key thing to understand is that most Americans, rich and poor, shop in supermarkets and supercenters. Likewise, most Americans, rich or poor, shop by automobile. Supermarkets and supercenters are fundamentally an automobile oriented retail format, and if we pretend that most people walk to the grocery store we will misdiagnose the problem. grocery trips are by automobile. Naturally, neighborhoods with adequate retail have a higher concentration of people without cars. And in rural areas without adequate retail, even most low-income Americans shop by car. My best summary of the evidence is that perhaps 2 to 6% of U.S. households lack good supermarket access. Food retail access is a serious concern for people without vehicle access. Possible remedies to improve local food retail have some merit, but should be carefully targeted based on need, and one should not expect these remedies to carry much of the burden of solving the obesity epidemic for the population as a whole. Some low-income neighborhoods are supermarket deserts and some are not. Following on another recent post, I enjoyed this video from Oxfam America, mocking what seems like the only bi-partisan consensus in Washington. Policy-makers preserve the rules that require most food aid to be purchased domestically and shipped in U.S. vessels, regardless of the aid agencies' own assessment of the most efficient delivery options. Lives are at stake. Food aid should be reformed. Harvard scientists recently tested the effects of the pesticide imidacloprid on bee colonies in situ, meaning out in the field instead of in a laboratory. At each site, four hives were treated with four different amounts of the pesticide. Beginning with the hives that received the highest doses, and continuing to the hives that received low doses, the bees died in a fashion symptomatic of colony collapse disorder (CCD). Reactions: The scientists say their findings show that even low doses of imdacloprid, similar to those used in real agriculture, can cause CCD. The pesticide's manufacturer, Bayer, says the low doses used in the study remained too high to be realistic. The EPA still considers CCD to result from a mix of factors, possibly including pesticide exposure as just one factor. That may still be a reasonable summary of the balance of current evidence, but the new study strengthens the case that pesticides -- imidacloprid in particular -- have a big role. ONE THING we can all do is to put pressure on our elected leaders to have the Environmental Protection Agency do a better job of regulation (“Study links pesticide to bee deaths; Harvard scientists make case,’’ Metro, April 6). The EPA does not test for the low-level chronic effects of pesticides such as those addressed in the recent studies. It also does not test for interactions between pesticides and other agricultural chemicals - and yet it is known that there are powerful synergies between some of these chemicals. Furthermore, the EPA farms out its testing to the very companies that are producing the pesticides - kind of like the fox guarding the chicken coop. Oxfam America and the American Jewish World Service (AJWS) explain here how much money could be saved -- and how many more hungry people could be fed -- if the United States reformed its food aid programs. Some of the key reforms include eliminating a rule that most food must be sourced from the United States and shipped in U.S. ships. For more detail on such issues, the best book is Food Aid After Fifty Years, by Chris Barrett at Cornell and my colleague Dan Maxwell here at the Friedman School at Tufts. A good recent report comes from the GAO: Local and Regional Procurement Can Enhance the Efficiency of U.S. Food Aid, but Challenges May Constrain Its Implementation. USDA's Know Your Farmer, Know Your Food website consolidates information from a wide variety of less-well-known programs that support farmers' markets and other local food infrastructure, facilitate local meat and poultry, promote local food sales to institutions such as schools and hospitals, and more. Rather than duplicate existing work with yet another layer of program authority, the website compiles information from a breadth of USDA agencies with their own separate budgets and chains of command. This simple inexpensive effort makes a powerful impression, articulating a sense of shared purpose for what might otherwise seem like a scattershot collection of tiny stand-alone projects. For a Department that sometimes suffers from accusations of serving only large-scale industrial farmers, the Know Your Farmer program humanizes a large bureaucracy and generates an outsized improvement in public reputation. For an alternative view, the coverage at Forbes seems to complain simultaneously that the Know Your Farmer program is underfunded and covers the same topics as existing programs. With a churlish spin, Forbes shares the same facts I just described above. Agriculture Secretary Vilsack and Deputy Secretary Merrigan this year launched the Know Your Farmer, Know Your Food Compass, with a link-heavy report and an interactive map, publicizing all sorts of local food activities supported by USDA. Because U.S. agricultural politics are local politics, the simple act of collecting small program data points by geography has a big communication impact. C. Peter Timmer and Michael Lipton today receive the annual Leontief Prize for Advancing the Frontiers of Economic Thought from the Global Development and Environment Institute at Tufts University. 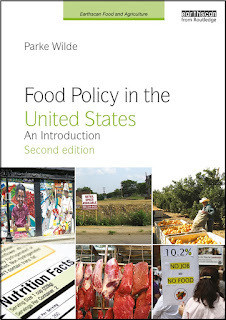 The 1983 book Food Policy Analysis by Timmer, Walter Falcon, and Scott Pearson influenced a generation of researchers in my field. Timmer and Lipton will be honored today, April 3, at 3:30 pm on the Tufts Medford Campus. Timmer will give a Friedman School Seminar tomorrow, April 4, at the Jaharis Building on the Tufts Boston Campus.